So for winter, I decided to make a new thread, it was never a tracker anyway. I never finished where I was going but I've changed direction. This is a brief mock up for the new tank and 18 inch wheel (rather than the 16 inch). Off the top of my head, I know I need: new rotor brushes, new drive chain, perf oil cooler kit and a seat. I also need to tidy up the wiring, probably redo the whole thing. I will also be making another battery box and adding controls to the handle bars. Here's my first question; Does anyone have a suggestion of how to mount a tank after shaving the old mounting cups off? Re-weld some cups? 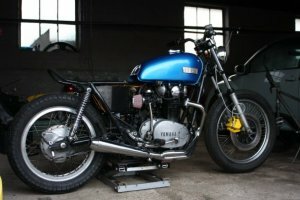 The xs400 tank has rubber mounts on the tank, like the xs650's.